I bought my lovely leather handbag in Bali the year before Willow was born (ah when we could flit off to the other side of the world on holiday. Now it’s a military operation to get to the park down the road). It’s big, soft and slouchy and great for just chucking things in. I used my bag everyday but after I had Willow it got relegated to the back of the wardrobe. I quickly realised that you need to be hands free at all times to react to whatever absurd situation taking a baby out in public throws up at you. Day to day I didn’t even bother with a handbag for the duration of my mat leave, as long as my phone and purse were in the nappy bag I was good to go. Except the time my purse wasn’t in the nappy bag, which I only realised while trying to pay at the Aldi checkout. To add insult to injury I was (trying to) buy wine; double fail. When I went back to work the bag was retrieved from its dark corner and dusted off. It formed part of the transformation from mummy Kat to back to work Kat and was a comforting reminder of the old me. A broken umbrella – the metal bits stick out everywhere but I figure its better than nothing when I need to protect my highly coiffed (ie. dry shampooed) bonce. Bananas wafer baby snacks – For me, not Willow. They’re yummy. Make up bag with cystitis powders in – essential for the onset of stingy pee a much loved perk of being a dehydrated mummy. Make up bag with a mirror, plasters, spare contacts and out of date eye drops which will probably finish off my eyesight in one squelch. Paracetamol – for headache, period pain, and pain induced by a screaming child and or moaning partner. Essential. My purse – the shittest, smallest purse in the world that has about 200 cards in. Sunglasses in the flimsiest case ever which offers no protection against scratching or arm bending. Deodorant – I have not stopped sweating since the day I gave birth, but am constantly freezing. Flipping hormones. Contact lense solution – for my knackered, itchy eyes. Bee pollen tablets – my afternoon buzz! Hand cream – I have the driest hands since having Willow. Probably because she poos a thousand times a day. That’s a lot of hand washing. Alcohol gel – essential for after an emergency bum change in less than adequate public changing facilities with one dried up wipe from the bottom of the nappy bag. An orange pig – of course. A pink rattly thing – I wondered where that sound was coming from. A pair of socks – I don’t know why. Breast pads – Five of, not even an even number and I’ve not breast fed since September! Some pilfered napkins – parenting 101: always have napkins on hand so I pick them up wherever I go. Oh Christ I’ve actually turned into my mum. An old prescription, appointment card, parking tickets and Boots vouchers – just sheer laziness that I’ve not thrown them away. An Oyster card – I live in Blackpool. Eight hour cream that is at least 15 years old and probably harbouring a strain of bacteria that causes instant death. Must post to Donald Trump. Paw Paw ointment – miracle stuff for my lips, another perk of being chronically dehydrated. A lip gloss that came free with a magazine – I’ve not bought a magazine since before Willow was born, much less read one. Five pens – what is the need? Am quite clearly a fledgling kleptomaniac. A mini hair brush – which is neither use nor ornament on hair dreadlocked with baby snacks. 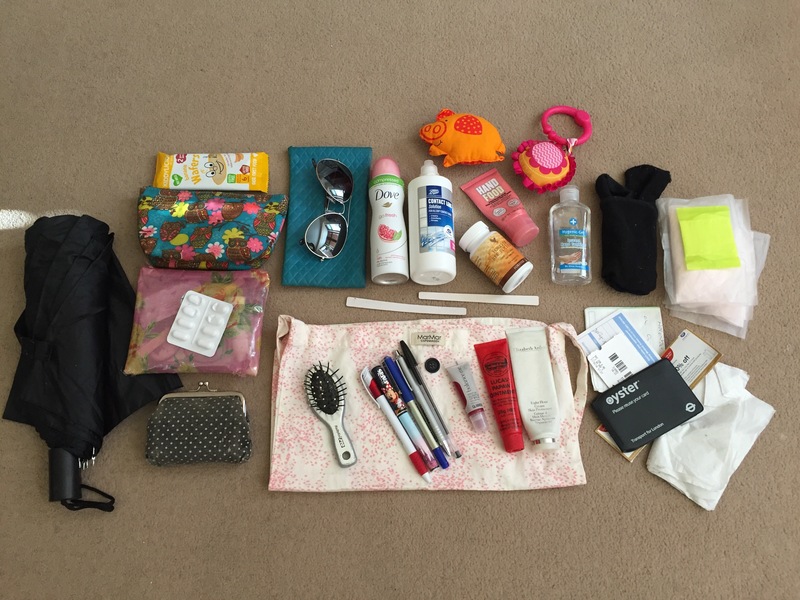 A spare bag – a bag within a bag – wtf? My phone, car keys and a bottle of water are normally in there too. I wonder what the contents of my bag say about me? I’m sure a psychologist would have a field day. Chaotic genius? Maybe not. Super unorganised mum on the run more like. It’s definitely time to de-clutter. So what can go? The majority of it to be honest. Although I do find it hard to part with things. As I’m looking at the contents now I’m kind of justifying them having their place. If I don’t fill it then my bag won’t fulfill its true potential. What’s lurking in your bag? Have you though about having a de-clutter or are you a hoarder like me? Have you had any handbag mishaps? I found a fruit pancake squashed up in mine not so long ago. I wonder which beautiful little monkey put that there? Leave me a comment, you can post a photo if you’re brave enough.